A talented harpist and singer, blending the arrangements exquisitely between Welsh, modern, classical, soul and rhythm & blues styles. 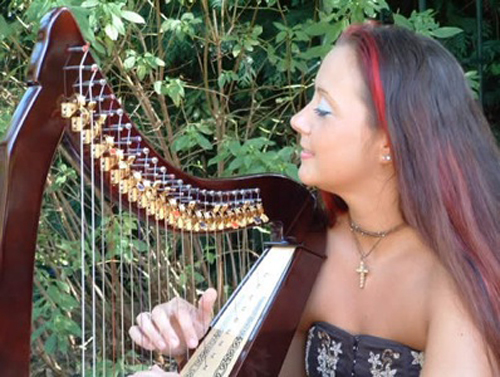 Bethan began singing and playing the harp at the age of ten. Since then she has won numerous awards in the Urdd and Cerdd Dant Eisteddfods. She has sung at the South Bank Centre London, Czechoslovakia, Bulgaria, East Germany, Brittany and Bavaria. She was also a member of Glissandi, a group of harps who also gained Gold at the Eisteddfods. On home grounds Bethan has played at the Welsh Proms attended by H.R.H. Prince of Wales and entertained the French and German delegation (Jacques Chirac, Lionel Jospin and Helmut Kohl) during the European summit. She played at an official opening of H.M. Parc Prison attended by the Princess Royal, V.I.P. Rowland International and was invited to play at the Conservative Political Conference attended by John Major. Bethan has performed at a wide variety of venues including S.S. Great Britain, Cardiff City Hall, St David’s Hall, Cardiff Castle, Castell Coch, Caerphilly Castle, Hensol Castle and Montacute House. She continues to sing and play at many functions, including Weddings, Dinners, Promotional Evenings, Official Openings, Concerts and Social evenings. Bethan delights in playing for weddings and has a repertoire list encompassing over a thousand tunes!